During 2018 commercial property sales increased 25% setting a new high of 137 vs 110 in 2017. The previous record of 120 sales occurred in 2003 with the low of 36 in 2008. The $2,233,069 Average Sale Price (ASP) was 79% higher than the $1,244,531 last year and 108% above $1,072,163 in 2016. The highest ASP for the last 16 years was $2.7M in 2005 and the lowest $584M occurred in 2000. This was primarily due to three large sales in Key West. Dollar Value of Sales rose 123% to a new high of $305,930,460, due to the 25% increase in sales and 79% increase in ASP. It was $136,898,392 in 2017 and $81.2 2016. The previous highest was $289M in 2005 with the lowest, $31M, in 2009. The margin between the SP/OLP (86.75%) and SP/FLP (92.54%) is 5.8%, which indicates, on average, a seller can anticipate price reductions during the term of the listing of nearly 6% from their Original List Price to the Final List Price prior to receiving a buyer’s offer and the sales price on average will be about 7% less than the final list price. Listings on Market: The number of listings increased 14% to 175 from 153 in 2017 and is up 16% from 251 in 2016. Average List Price increased 18% to $1,740,779 from $1,471,922 in 2017, which also was down 24% from $2,275,133 in 2016. 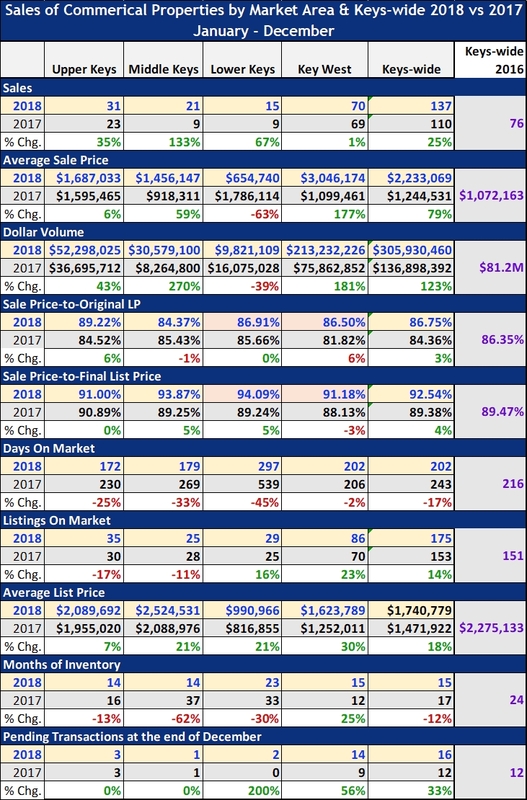 Pending sales, are properties under contract that have various contingencies to complete prior to closing, usually within the next 30 to 60 days, provide an indication of the number of additional properties that will close in that time frame, increased by 33% to 16 from 12 in 2017 and 2016. Here, we detail commercial market activity for each of the four major submarket areas during 2018 compared to each year since 2000 thereby providing a continuing historical perspective of commercial sales. As a reminder, the Upper Keys consists of properties from Lower Matecumbe to Key Largo. The Middle Keys includes properties from the Seven Mile Bridge to Long Key. Lower Keys properties range from Bay Point to Big Pine. Key West properties run from Old Town to Shark Key. 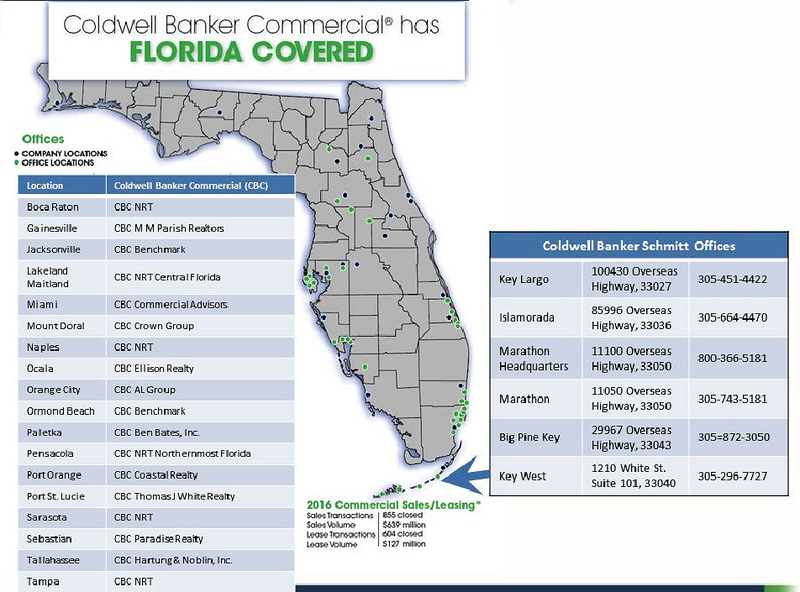 The properties in this report include commercially zoned land, multi-family residential, hotels, motels, and office space as well as industrial and retail (which includes restaurants) with sales registered in the Keys MLS system. The gold background denotes the highest number and the blue background, the year with the lowest number for each of the three categories, Total Number of Sales, Average Sales Price and Total Sales Volume Dollar Value. Following Hurricane Irma, we didn’t anticipate a repeat of the slump we experienced post-Hurricane Wilma since the factors that led to that slump weren’t present in 2017. The commercial market since Irma has remained much the same as before it arrived on September 10. Sales: The number of commercial sales peaked in 2003 for Key West (72), 2005 for the Middle (29) and Upper Keys (24) and 2006 for the Lower Keys (15). Sales bottomed out for the Lower Keys (1) and Key West (19) in 2008, and 2009 for the Upper Keys (7) and Middle Keys (4). In 2018: Key West had 70 sales, the second highest on record. The Upper Keys set a new high of 31 besting the 24 in 2005. The Middle Keys had its highest number since 2005 with 21. The Lower Keys tied the record high of 15 sales in 2006. Keys-wide commercial sales also set a record with 137 vs 120 in 2003. The Key West market remains the most active market with a historic average dating from 2000 of 52% of all commercial sales, followed by the Upper Keys with 23%, then 15% for the Middle Keys and 10% for the Lower Keys. Average Sales Price: The Key West market had the highest ASP, $3.046M, nearly tying the 2005 record of $3.099M. The Upper Keys averaged $1.6M followed by the Middle Keys at $1.4M and the Lower Keys at $654K. Keys-wide, the ASP increased 79% to $2.2M due to the 177% increase in the Key West ASP, the result of four sales amounting to $109M. Total Sales Volume Dollar Value: During 2018, the Keys-wide ($305M) and Key West ($213M) markets set new records for dollar volume of sales previously established in 2005. That was the year commercial sales peaked in all areas (except for the Lower Keys which was 2006), when the Upper Keys commercial market had the highest number of sales combined with the record ASP, Key West notched its highest total, and the Middle Keys attained its second-highest ASP. The Lower Keys dollar volume of $21.7M peaked the next year as 2006 was that market’s year for record sales and, at that time, the highest ASP for the area. Since 2001, the Key West market area dollar volume of sales, as it has with the total number of sales, accounted for over half of the commercial market with 56%. For 2018, it was 70% of all dollar volume followed by the Upper Keys with 17%, Middle Keys with 10%, and 3% for the Lower Keys. In 2018, the 137 commercial sales account for 5% of all sales by number of sales but 16% by dollar volume of sales.